After reaching 20 hours or more in Bethesda’s Fallout 76 coming away from that feels like we haven’t accomplished anything. A shame, because on the surface West Virginia looks really nice and the gameplay is reasonably tight. The idea of playing with others on the fly a la The Elder Scrolls Online is good. However, the execution falters somewhat. Let’s recap. 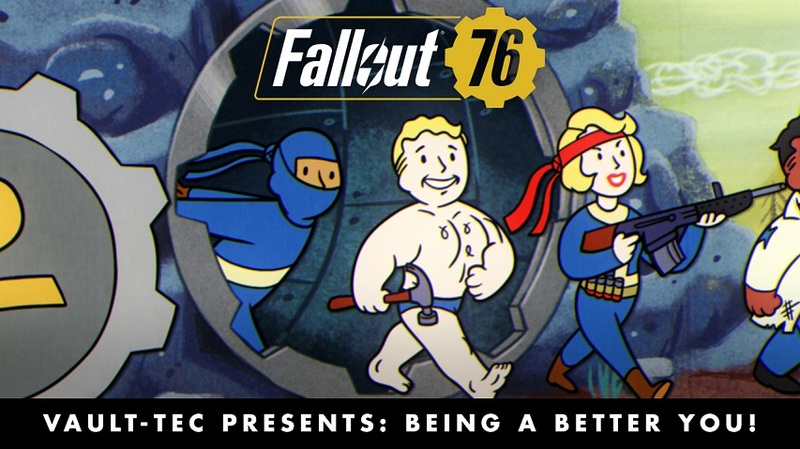 After the success of Fallout 4 and its VR version, The Elder Scrolls series and subsequent The Elder Scrolls Online, Bethesda presents Fallout 76. 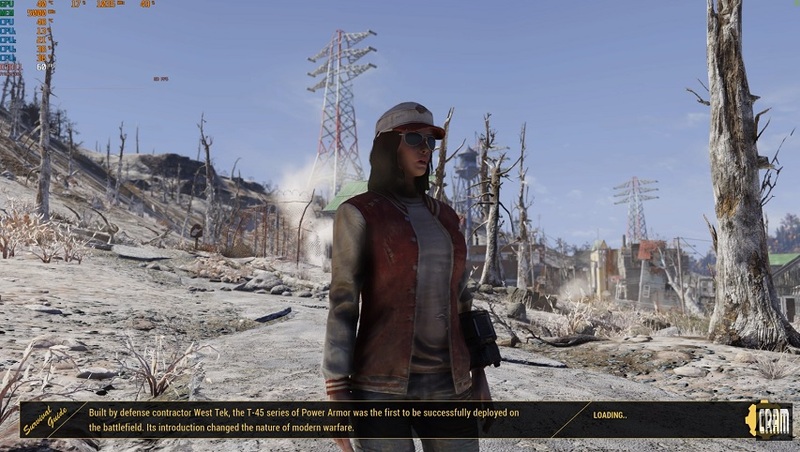 Using a familiar setting and the same template as Fallout 4 the difference here is all characters in game are online adventurers. Players discover the lack of any AI controlled NPCs once the opening of the vault 76 door. If you’re lucky, another player hanging around the starting area might cross your path. If not, then cue potentially many hours of solo wandering reading notes, accessing terminals and listening to holo tapes. 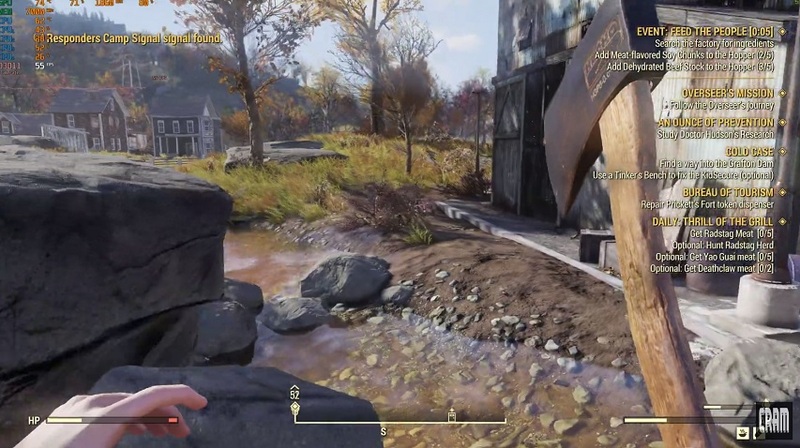 Yes, Fallout 76 takes solitary to new levels despite the promise of a shared experience being the main pull here. On one hand though, solo adventurers can dive into the open world with relish. Lots of enemies present themselves coupled with exploration that is thrilling and filled with dangers – kind of. The barren nature of West Virginia post the war feels colourful, offering plentiful places of variety to explore. The survival aspects cranked up to 10 encourage resource gathering, searching in every cupboard and hoarding items. It works, and ultimately is fun to play if an open-book approach appeals. Combat is good, with lots of guns, melee weapons and customisation options to tinker with. It’s Fallout without a doubt and familiar ground for anyone well versed in its quirks. It’s enough to ignore any minor glitches with enemies getting stuck on scenery or not really being there when shot. 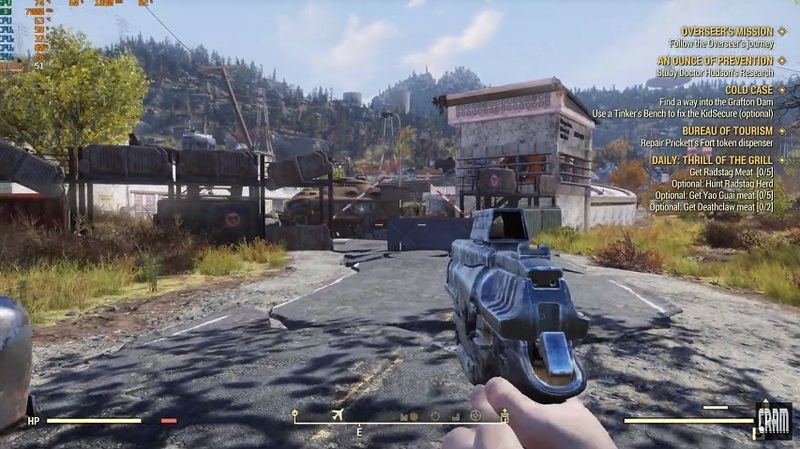 Bethesda always maintained Fallout 76 caters to solo players and those who wish to experience the Fallout world with other players in tow in equal measure. Yet, on the flip side, playing solo is demanding, draining even and with the lack of NPC interaction feels shallow and devoid of character. After so many hours alone wandering the lands, performing all manner of quests and jumping into events clearly designed for multiple players it gets dull unfortunately. The multiplayer aspect doesn’t always work as intended. In some instances meeting up with others happens and even taking part in events can occur on the fly. These moments are fun and show the potential. However, once events complete, every person moves on and it’s back to the lone wandering. The problem here is, it seems a number of players enter the game expecting the solitary single-player experience and conduct themselves in this way. So teaming up as the game dictates is rather difficult. In our experience on PC, no one wants to do that. It’s easy to just follow another character in an aimless fashion, perhaps acting in a supporting role if one’s level is higher. But the actual forming a proper team to go questing together is a challenge in itself. In some 20 hours playing we received no invitations to join other players games. Go figure! Perhaps Bethesda didn’t think through the systems to get like-minded players together easily. Rather than players joining maps with random players, a lobby system like many MMOs employ would solve the problem. Players meet up in lobbies, form teams, then head into the wastelands together. The idea, the entire map is a lobby of sorts just doesn’t work in our experience. Another way to solve the problem is allow players the choice of what maps to join from the main menu. Have maps filled with players looking for multiplayer experiences, and others dedicated to the solo game. That way, players know what to expect when they hit the Play button. Looking at the visuals and in some ways, the large map presents far more interesting locales in comparison to Fallout 4 despite the lack of any populated areas. But, let’s ignore the comparisons for now as both games have an entirely different remit. West Virginia is a lovely place full of radioactive rivers, hills and mountains, valleys and dilapidated settlements. The core map and the assets within look great with neat visual effects on occasion. However it is what’s inside the map, content wise letting the team down so to speak. In terms of performance, it’s a mixed bag because even with an RTX 2080 Ti some areas dip below the 60 fps threshold at 4K resolution. For the most part, around 50-60fps is quite possible at max settings. For lesser systems toning it down nets the desired results but this is the nature of the open-world beast. Ups and downs and strange optimisations. Once again, Bethesda scores a wonderful soundtrack with licensed tracks for the radios to in-house produced classical score. Either act as a perfect complement to the gameplay and can’t be faulted. Other sound effects come at you often with frightening results when jumped on from a scorched (that’s the humanoid enemies) from the dark. However, it’s the delivery of the spoken word that feels disentangled from the world. Sure, the audio files in the classic Bioshock worked wonders in its claustrophobic horror setting, but here comes across disjointed and uninteresting to follow. Why Bethesda changed the quest template that worked for them in all their previous games is staggering. Some NPCs with a bit of life provide much-needed reason to perform actions in the game world and here just dearly missed. Players can sink untold hours into the wastelands, levelling up, surviving and as mentioned, playing guardian angel or rogue “griefer” to their heart’s content. The size and opportunity to play is not in question at all, and rightly so for the full price requested here. The bigger issue is how long players endure the experience before moving on to greener pastures. As an MMO game, other efforts do a better job of enticing players including Bethesda’s own TES Online. As a single player game, again other games offer more enticement to stay. 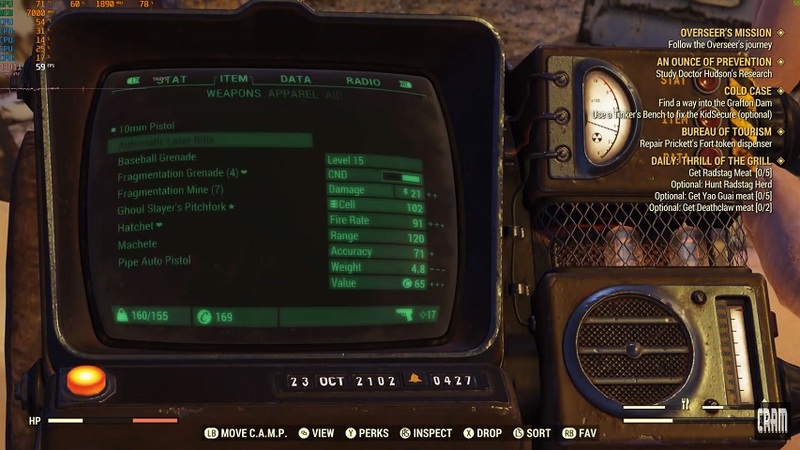 Fallout 76 might sound good on paper and in some ways it works for players with very specific gaming requirements. With friends, the multiplayer aspects are sure to be fantastic and filled with joyous moments. However, for those who play alone or don’t have friends willing to join the adventure, making new ones here is a tough campaign. Fallout 76 isn’t a bad game per se, far from it. But a little more refinement in its systems would help provide it a better footing in the grand scheme. What remains for what we assume for the majority of players is a solitary experience, devoid of any redeeming qualities after extended hours playtime that hands gamers a by the numbers card. This approach ultimately feels lifeless and lacking in memorable charm. A shame then, as the core game is commendable and fun to play in smaller doses.